Safari has a history of delivering innovative new features while retaining one of the simplest user interfaces among major browsers available. In Mountain Lion, Safari removes the Google search field (and its SnapBack button) to leave one single location field. From that single field, you can now just type the beginning of a website location, a search engine query, or reference a saved bookmark or recently visited page in your history. Safari continues to suggest alternatives as you type, but now it populates the results with potential searches recommended by Google (which remains the default search engine; Yahoo and Microsoft remain alternative options for search). 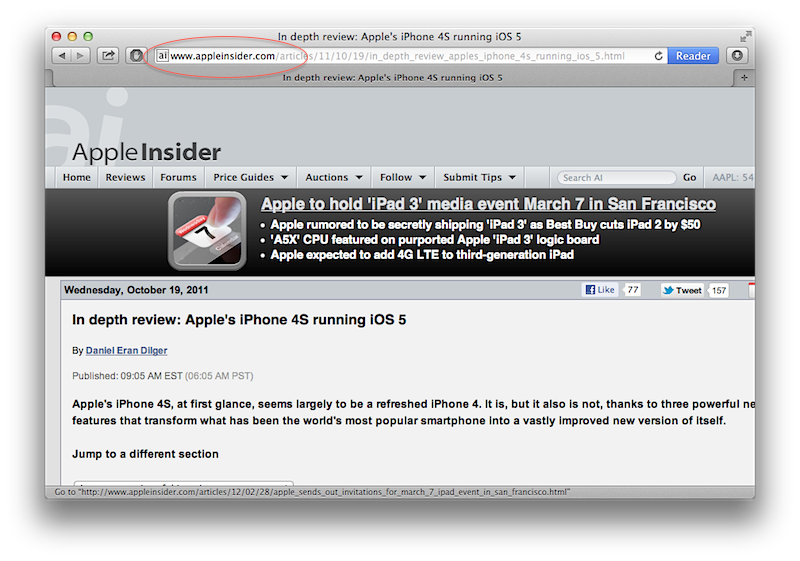 Also new in Mountain Lion's Safari is textual highlighting of the host in the displayed URL (as shown below, circled in red). This helps users, particularly the less technically inclined, see what server is hosting their page among all the other code in the URL pathname. The feature should help users notice when a phony site is being used to display what appears to be a reputable site, such as when a known fraud site like "Hardcashhijackinfo.net" hosts a malicious, phishing version of PayPal.com, advertised via email spam warning users they must log into their account following a hyperlink. 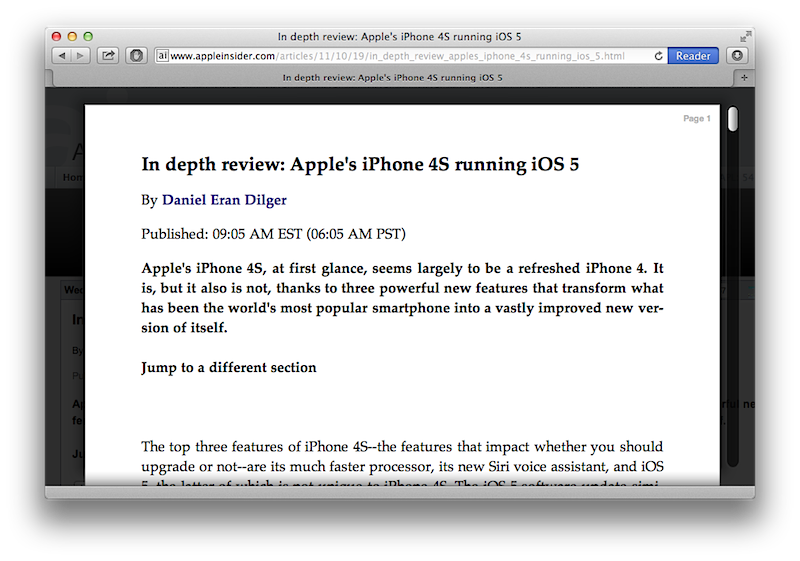 Another new simplification of the Safari window is the newly omnipresent Reader button. Click it and it enters Reader for you on the selected page. When there's nothing to read, the button is simply greyed out. 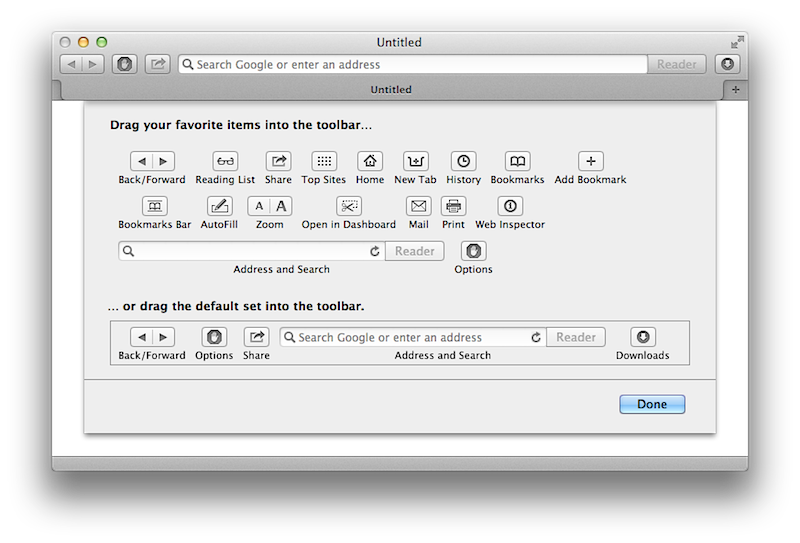 Other button options remain the same (note that the Options button shown belongs to the optional Ad Block Safari Extension, and is not new to Mountain Lion), although the default set of buttons has changed to add a Share Sheets button. The new Sharing button presents alternative ways (from its menu, below top) to add a page to the Reading List, Top Sites or other Bookmark folders, or email the content of the web page, all of which were previously available as menu bar options or keyboard commands, but now more conveniently accessible via the Sharing button. Sharing also introduces new options to Message or Tweet the url. 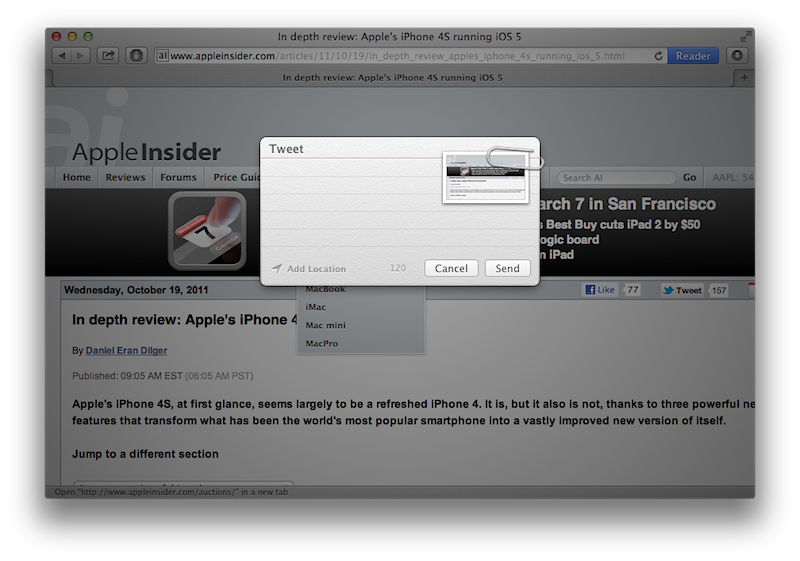 The Twitter sharing feature uses the same tweet user interface as iOS.